« Is the Crab Nebula being energized by a superwave? 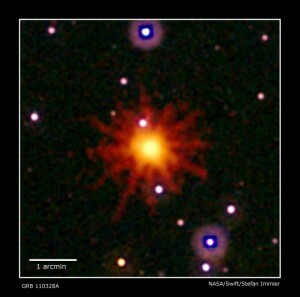 GRB 110328A: First ever observation of a newly formed quasar! “Except this supernova does seem unusually bright,” interjected Tom Cook. There was a whistle around the common room. “More like a bloody quasar than a supernova,” muttered someone. “What’s that, Dr. Almond?” Gaynor asked, his eyes red with lack of sleep. “Why the position of the thing is so precisely the same as the Galactic center. It’s obvious really, isn’t it? The center of the Galaxy has blown up.” Almond’s deep voice was grave as he made this pronouncement. We may be seeing the same sequence of events playing out in real life with the discovery of the source GRB 110328A which may actually prove to be a quasar, the first ever to be seen turning on. 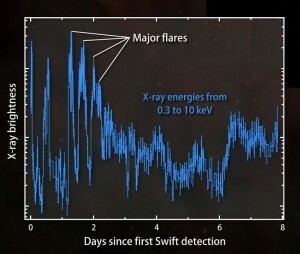 The initial appearance of this X-ray and gamma ray source was first detected by the Swift telescope on March 28, 2011. It was found to be located at the center of a galaxy in the constellation of Draco situated about 3.8 billion light years away (z = 0.35). Seeing that the source continued its highly energetic activity even days afterward, astronomers began to realize that what they had been observing was something other than a mere gamma ray burst (GRB). Most gamma ray bursts, on the other hand, last from a minute or so to several hours at most. But in seeking an alternate interpretation, astronomers have leaned towards the less dramatic and proposed that we are observing a “supermassive black hole” that is in the process of tidally disrupting and consuming a passing star. For example, on April 14th, after the source had been active for over two weeks, astronomers Almeida and De Angelis proposed just this in a paper they had submitted for publication to Astronomy and Astrophysics journal. They propose that we are seeing a black hole having a mass of ~107 solar masses ripping apart and consuming a red giant star of mass 0.5 to 5 solar masses which had happened to orbit too close to it. They state that if their theory is correct, we should expect that the intense X-ray emission from GRB 110328A to not last more than a few weeks to a few months, i.e., the time taken for the red giant star’s mass to become completely consumed. In fact in their April 14th paper to Astronomy and Astrophysics, they state that the emission should be seen to begin to fade within a few days to a few months. Now more than a week has passed since the date they posted their paper, so the predicted lower limit of a “few days” has been well exceeded. If the source continues its current variable activity after a few months from now, then like Dr. Almond in Hoyle’s novel, astronomers will be forced to consider the inevitable, that what we are seeing is more like a “bloody quasar” than the transitory burp of a black hole! 1) the X-ray emission is coming from the exact center of the host galaxy, hence from its core. Similarly, quasars are known to be galactic nuclei in their active state, hence a galactic core observed during its active phase. 2) the average long-term emission coming from GRB 110328A is seen to have an intensity in the range of what is observed to come from a quasar. That is, quasars typically have X-ray luminosities that range from 1043 to 1048 ergs/s whereas Almeida and De Angelis report that this object has an average X-ray luminosity of about 2.5 X 1047 erg/s. So GRB 110328A is near the upper end of the quasar luminosity range. 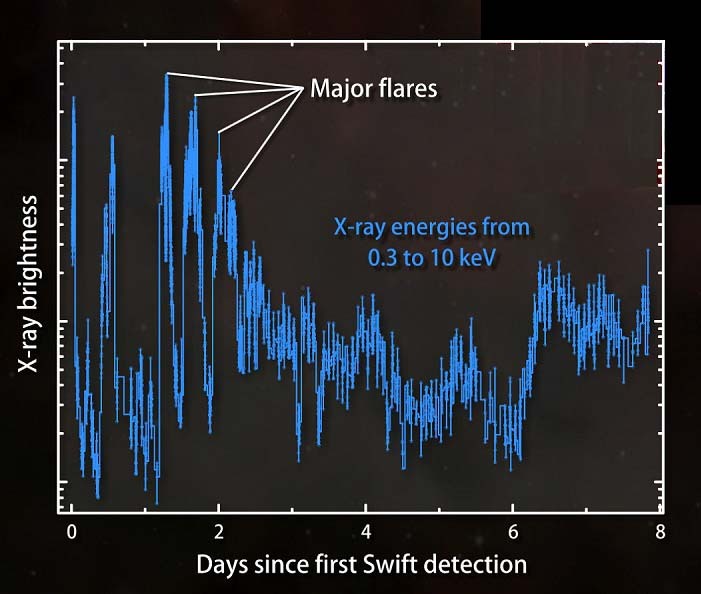 3) Whereas the X-ray luminosity from quasars is observed to erratically vary by many fold over a period of anywhere from hours to weeks, similarly the emission from GRB 110328A has been observed to vary erratically on a timescale of a few hours to a day, very similar to a more rapidly varying quasar. 4) Like a quasar, GRB 110328A emits synchrotron radio emission. Radio emission from this source was reported on April 11th by Brunthaler et al. X-ray intensity lightcurve for quasar PDS 456. Considering that we may be observing for the first time the onset of a quasar, there are several interesting things that we can learn from GRB 110328A. Second, when it initially turned on, its luminosity was about 20 times greater than the value it attained days later. 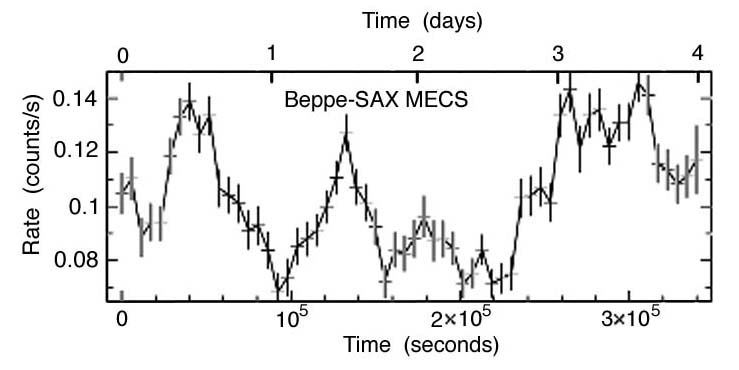 At its initial onset it achieved a luminosity of around 5 X 1048 ergs/s in two peak events separated a day apart. Hence in its first days it would have been one of the most luminous quasars in the sky. This is very significant. For it implies that a first strike from our own galactic core may deliver its most deadly effects in the first day or two, with intensities an order of magnitude greater than what we would later be exposed to. We will keep you updated with more as this story unfolds. Meanwhile, for those interested about the core explosion phenomenon, click here. For those who might have doubts that GRB 110328A is an example of a supermassive black hole tidally disrupting a passing star, and who might be interested in learning of an alternative way to conceive of the supermassive objects that form the cores of galaxies, click here. For evidence that the core of our own Galaxy is most likely not a supermassive black hole, but a mother star, visit our subquantum kinetics forum (starburstfound.org/sqkblog/) and in particular the posting entitled “Evidence Against Black Hole in Galactic Core“. Further evidence against the black hole theory is discussed in the books Subquantum Kinetics and Genesis of the Cosmos. One Response to GRB 110328A: First ever observation of a newly formed quasar! Has there been any news on this since April 21? Is it still emitting GRBs? There seems to be a news blackout on this! Son of a gun on Possible Arrival of a Galactic Superwave within the Coming Months? P. LaViolette on Possible Arrival of a Galactic Superwave within the Coming Months? Starburst Forums: Galactic Superwaves | Powered by Mantra & WordPress.